The inaugural season of the United States Football League culminated in the Spring league’s first Championship game on July 17, 1983 at Denver’s Mile High Stadium. Participants were the Michigan Panthers, winners of the Central Division title at 12-6, and the Philadelphia Stars, who finished atop the Atlantic Division with a league-best 15-3 record. Head Coach Jim Stanley’s Panthers had started off slowly at 1-4 before catching fire. 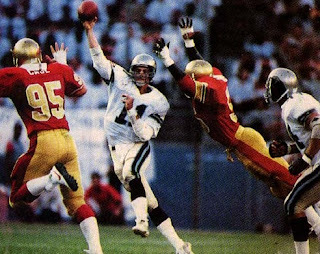 Rookie QB Bobby Hebert (pictured above) developed rapidly into a star and ended up topping the league’s passers. Heralded first-year WR Anthony Carter got off to a slow start but, along with WR Derek Holloway, added an explosive element to the offense as the season progressed. Ken Lacy and John Williams were steady running backs. All were helped by improved line play as the club signed veteran guards Tyrone McGriff and Thom Dornbrook plus OT Ray Pinney. The defense was keyed by LB John Corker, who led the USFL with 28 sacks and the team with 116.5 tackles. NT Dave Tipton was a standout on the line and another heralded rookie, SS David Greenwood, led a fine backfield. The Stars, coached by Jim Mora, were a less explosive club than the Panthers but had been steady all year. QB Chuck Fusina directed a ball-control offense that featured rookie RB Kelvin Bryant. The defense was rugged and opportunistic, having given up a league-lowest 11.3 points per game during the course of the season while compiling a +35 turnover ratio, also the USFL’s best. It included undersized but highly effective LB Sam Mills, who led a solid unit, and another All-League player in SS Scott Woerner. The Panthers had easily won their Semifinal playoff game over the Oakland Invaders while the Stars had to stage a dramatic late comeback to defeat the Chicago Blitz in overtime to reach the Championship contest. The game was played before a crowd of 50,906 in 80-degree heat. The low-scoring first half was filled with mistakes by both teams. Late in the first quarter, Bobby Hebert ran 20 yards for a first down in a third-and-15 situation to spark a drive that ended in the game’s first score, a 33-yard field goal by Novo Bojovic. The Stars evened the score with a 30-yard David Trout field goal that ended a 13-play, 64-yard drive midway through the second quarter. Late in the first half, the Panthers put together an 80-yard scoring drive. In a third-and-20 situation at the Michigan 10, Hebert threw to Anthony Carter for a 27-yard gain. Ken Lacy ran the ball twice for 11 yards and then Hebert connected with Carter for 12 yards to the Philadelphia 40. A pass interference call on CB Jonathan Sutton moved the Panthers to the 25 and once again the Cajun quarterback found Carter at the sideline for a 13-yard gain. Forced out of the pocket on the next play, Hebert threw across to field for Derek Holloway, who scored a 12-yard touchdown. Although Michigan had outgained the Stars by 251 yards to 69, the score was only 10-3 in favor of the Panthers. Following the second half kickoff, the Panthers put together an 80-yard drive in 15 plays that consumed over seven minutes, converting five third downs along the way. The key play was Hebert’s throw to Lacy that picked up 28 yards to the Philadelphia 31. Holloway scored a second TD, this on a 14-yard pass play, and with the successful extra point Michigan was up by 17-3. The Stars had a chance to put some points on the board later in the period. Kelvin Bryant ran for a 22-yard gain after seemingly being bottled up in his own backfield. Chuck Fusina threw to WR Scott Fitzkee for gains of 20 and 17 yards. However, the drive stalled and, following an incomplete pass by Fusina on a third-and-four play, David Trout missed on a 34-yard field goal attempt. Philadelphia finally scored again on its next possession, although the Stars had to settle for a 28-yard Trout field goal after having a first down at the Michigan eight. The big play of the series was an option pass by RB Allen Harvin to WR Rodney Parker that picked up 44 yards. Bryant again had big runs along the way. However, John Corker sacked Fusina for a crucial six-yard loss that set up the field goal. The Stars got a big break when FS Mike Lush intercepted a Hebert pass and, after lateraling to Scott Woerner, Philadelphia had the ball at its own 41. Utilizing an efficient short passing game, the Stars moved down the field. Fusina threw to Harvin for eight yards, ran two yards for another first down, and then passed to Fitzkee for ten. A defensive holding penalty gave Philadelphia another first down. In a fourth-and-four situation, Fusina threw to WR Willie Collier for a first down at the Michigan 24. Two plays later, Fusina connected with Collier again, who made a diving catch in the end zone for a TD. The Stars went for a two-point conversion and Fusina, rolling to his right, hit Collier once more to make it a three-point game at 17-14. There was still plenty of time, with 8:49 left on the clock. The Panthers got a first down on their next possession but moved no further and punted. However, David Greenwood’s wobbly kick bounced past Woerner and the Stars were pinned back at their five yard line. 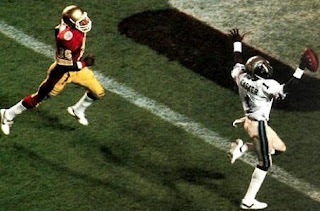 They couldn’t move either and Sean Landeta boomed a 52-yard punt that Carter fumbled but recovered. Again the Panthers got a first down, to the Philadelphia 48. Ken Lacy was injured on a play that gained no yardage and, after the running back was helped off the field, the Stars called a timeout to try and conserve more time. On the ensuing second-and-10 play, the Stars blitzed but Hebert got the pass off to Carter, who had beaten CB Antonio Gibson and cruised into the end zone for what proved to be the game-clinching touchdown (pictured below). There were just over three minutes remaining in the game. The Stars fought back but ran out of time. They scored a TD on the last play of the game, on a two-yard pass from Fusina to Parker, with fans already beginning to swarm the field. Michigan came away the winner by a final score of 24-22. The Panthers, who dominated on offense for most of the contest, outgained Philadelphia (447 yards to 324) and had the edge in first downs (25 to 24). However, Michigan suffered the only two turnovers of the game. Each team recorded four sacks. Bobby Hebert, the game’s MVP, completed 20 of 39 passes for 314 yards and three touchdowns with one interception. Anthony Carter had a big day, catching 9 passes for 179 yards and the game-clinching TD, but also dropped three passes and mishandled two punts. Derek Holloway had three catches for 39 yards, two of which were good for scores. RB Cleo Miller led the club with 80 rushing yards on 12 carries and Ken Lacy, who left the game with an injury, gained 56 yards on 15 attempts. For the Stars, Kelvin Bryant was, as usual, the key producer on offense with 89 yards on 13 carries and four pass receptions for another 15 yards. Chuck Fusina was successful on 25 of 47 throws for 192 yards and two TDs with none intercepted. Scott Fitzkee and WR Tom Donovan each caught 5 passes, for 58 and 36 yards, respectively. Michigan came back strong in 1984, winning its first six games before injuries, most notably to Anthony Carter and David Greenwood, caused the team to sputter the rest of the way. The Panthers made it to the playoffs as a Wild Card team but lost in an epic overtime game at Los Angeles in the first round. The Stars, playing like a team on a mission, were again dominant during the regular season and once more advanced to the league title game, which they won in less dramatic fashion over the Arizona Wranglers.